We interpret experience from our human scale. The impact of technology and connectivity on place is already visible. Place is where people interact with the digital and physical. Making this seamless and coherent is the starting point, enhanced by other elements that elevate the human experience of place: resonant, engaging, supportive, even life-changing. People’s expectations of experience are conditioned by the almost-human, responsive way their smart devices interact with them. People expect to self-direct their lives, to shape and curate much of what they experience. Design will invite their participation, using the “smarts” that places, spaces, and products will acquire. Experience — the sum of our interactions with the world around us — is increasingly the focus of design. In a digital era, a one-note, one-dimensional experience fails to impress. You have to connect with people emotionally at every moment in their journey, and map how that experience unfolds. A brand experience center, Cadillac House fuses hospitality, retail, automotive design, and gallery display. How can environments seamlessly blend the digital and the physical to leave lasting, memorable impressions? At Cadillac House, the 12,000-square-foot space at the base of the car company’s headquarters in New York, customers are taken on a journey that defies convention. It’s not a dealership or retail destination. You can’t even buy a car here. Cadillac House is a brand experience center that fuses hospitality, retail, automotive design, and gallery display to create the unexpected. 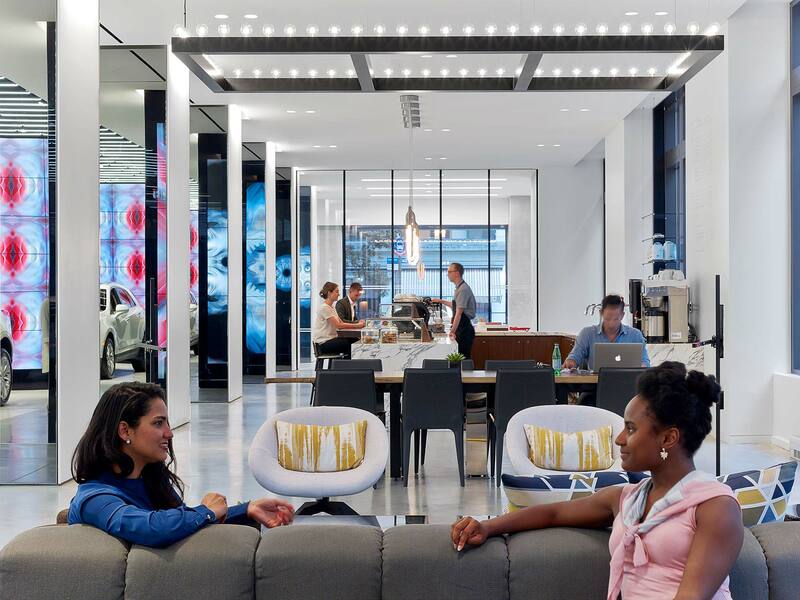 Gensler helped bring “downtown cool” and relaunch the brand with a space that embraces Cadillac’s heritage, with a focus on the creative class. From the street, an exterior veranda with interactive elements engages the public. Inside, visitors encounter a “runway” with fully integrated digital displays using a generative system to showcase Cadillac’s latest models and brand stories. The space transforms based on time of day or events, leveraging like-minded partnerships, such as CFDA, Visionaire, and Joe Coffee. With a public café, lounge area, event venue, gallery space, and rotating retail lab, the facility serves a mix of uses, inviting visitors to stay, browse, and explore. Cadillac House expresses a new vision for Cadillac, one that can pivot as the brand evolves. On a broader scale, sports and entertainment facilities are also transforming the fan experience. 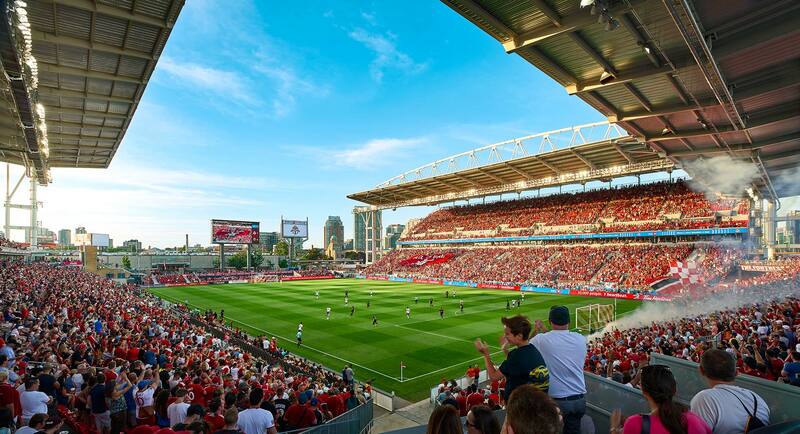 At Toronto’s BMO Field, the Tunnel Club gives fans close-up, personal views of the players. Similarly, Ford Center at The Star provides fans unparalleled access to Dallas Cowboys operations. The only NFL training facility in the US shared with a public high school district athletic program, the facility serves as a unique community amenity for the City of Frisco, Texas. The best experiences anticipate people’s needs, tap into their emotions, and engage the senses. Communal experiences are an integral part of museum programming. 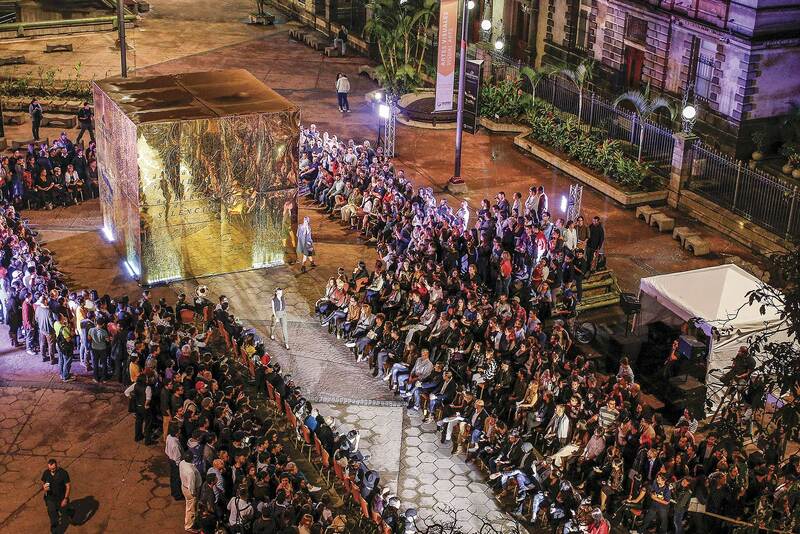 Traffic, the Costa Rican fashion magazine, collaborated with Gensler to promote Costa Rica’s heritage through a pop-up fashion design exhibit at Museos del Banco Central in San José, culminating in a live runway show on the plaza. According to Forrester Research, US e-commerce sales are projected to reach nearly $500 billion by 2020. This rapid growth is leading retailers to shift to a more discovery-centric model to attract new customers. At Primark’s King of Prussia store, a glass exterior façade with LED windows displays moving and static imagery to entice visitors. Inside, a digital roundabout comprised of 32 LCD screens features global fashion trends. 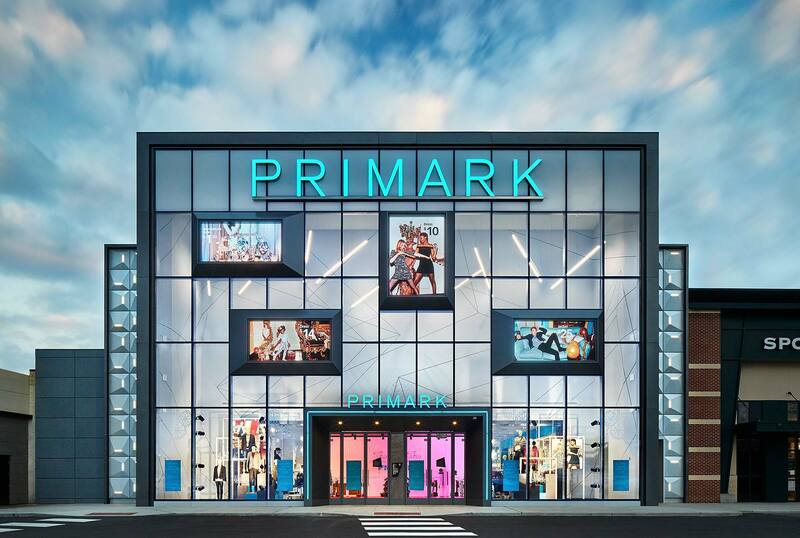 Digital-savvy shoppers can connect with Primark’s #PRIMANIA online feed and elements such as “selfie ready” fitting rooms. 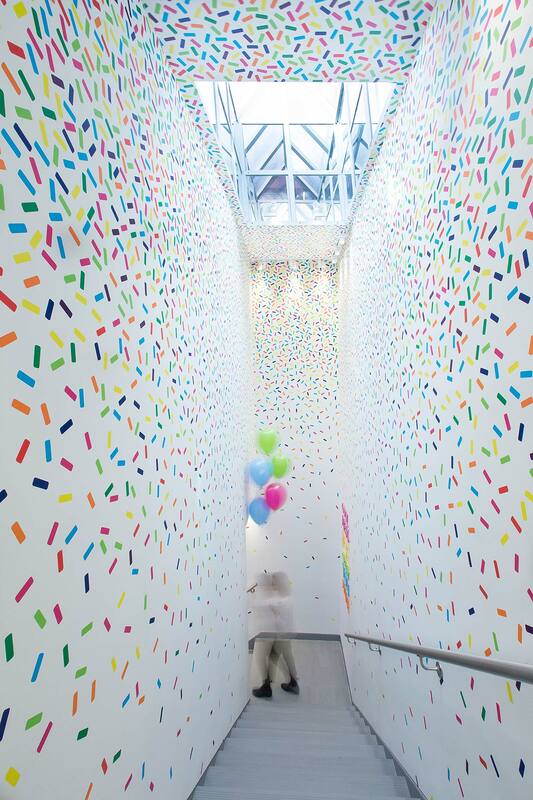 Social spaces are embedded throughout CoolMess, an ice cream concept store in New York, where kids post photos of themselves and their creations on a magnetic wall, and upload them to the #CoolIsTheNewHot Instagram feed. A cyclorama backdrop paired with careful lighting creates the illusion of infinity. Hyundai Capital Convention Hall blurs the lines between art and architecture. In a digital era imbued with sensory overload, people are also seeking moments of respite. Hyundai Capital Convention Hall in Seoul, South Korea, offers a counterpoint. Gensler designed a custom, 6,250-square-foot assembly space atop Hyundai Capital’s global headquarters to create a flexible environment defined by a compelling design, cutting-edge technology, great acoustics, and innovative lighting. A curved acoustical plaster shell forms the basis for the interior of the hall. The project blurs the lines between art and architecture by changing one’s perception of materials, light, and space. HOLISTIC: “Place” is real/virtual, so experience design blends them. RESONANT: The best experiences speak to and through the senses. SEAMLESS: Every touch point contributes to the experience. When values matter, working with purpose is an important motivator. Brands with strong values build strong ties to their mission through workplace design. 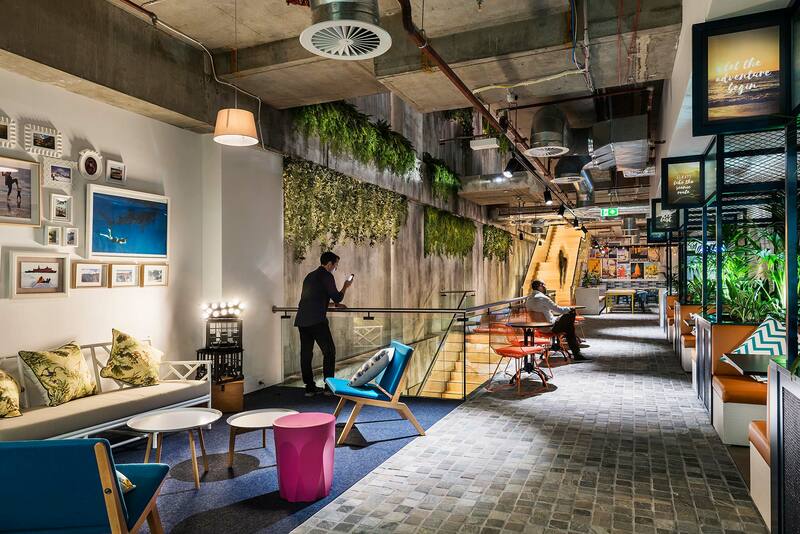 These places embody the brand in ways that attract, retain, and motivate workers to innovate. 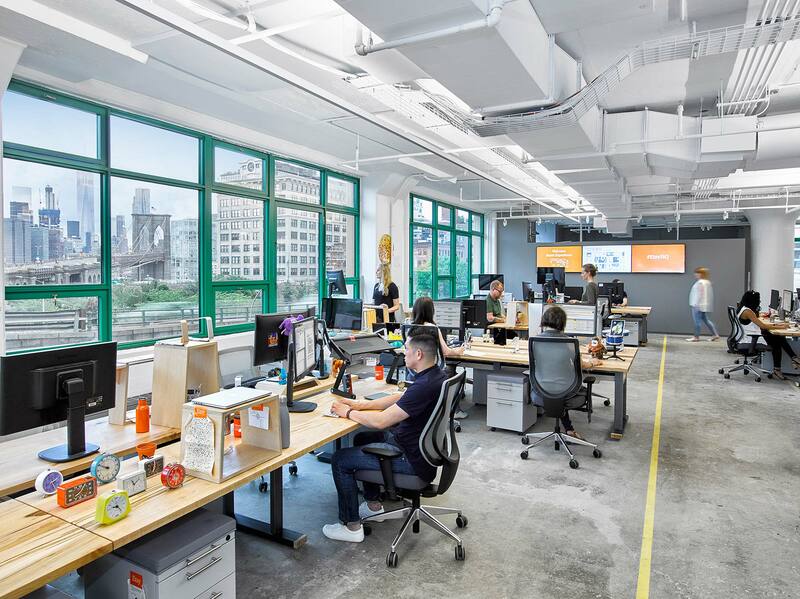 Etsy’s values of craft, community support, social innovation, and sustainability are reflected in the space. Experience is key for companies seeking to make their purpose relevant and emotionally engaging to employees. In a values-based world, brands must live their mission every day. Office buildings function as dynamic ecosystems that support purpose and innovation. There’s no better example than the Etsy headquarters in Brooklyn, where a reprogrammable work platform celebrates the handmade. A journey through the space weaves a narrative built on local maker, artist, and artisan contributions. It sets a new standard for the values-based workplace—putting a priority on inclusivity. The company culture thrives on a variety of collaboration spaces, open lounges, and pantries with communal tables. Amenity floors include well-stocked maker spaces for staff and community members to learn woodworking, 3D printing, weaving, and silk-screening. And every material has been vetted to meet the rigorous environmental standards of the Living Building Challenge. This new office is a collection of destinations, each with a strong focus on human needs. Experience is a key consideration for companies seeking to make their purpose relevant and emotionally engaging to employees. 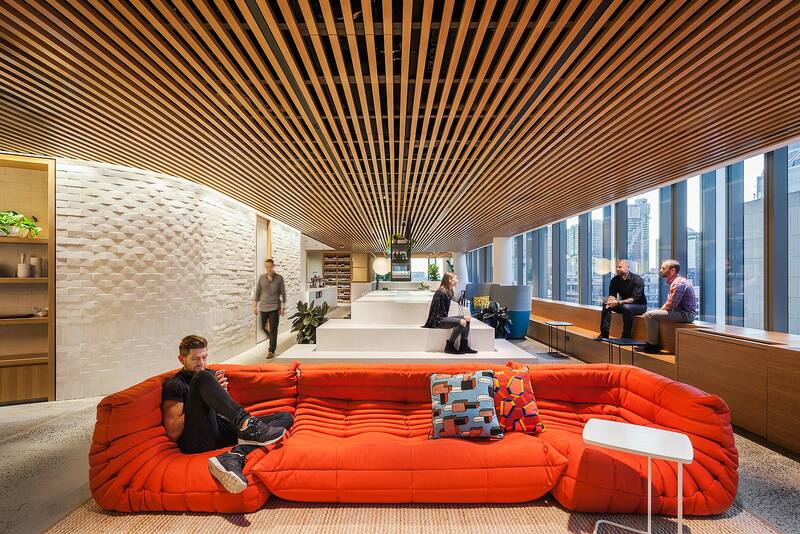 The new offices for Dropbox in Sydney, Australia, were built around the concept of “workplace at home.” The team developed guiding principles for the design, with a strong focus on human needs, enhancing productivity, and fostering a community in which everyone feels part of a common effort. Employees at the new headquarters of Instagram in Menlo Park, California, now spend their work hours in space that is designed to feel like a 3D version of the popular photo-sharing app. 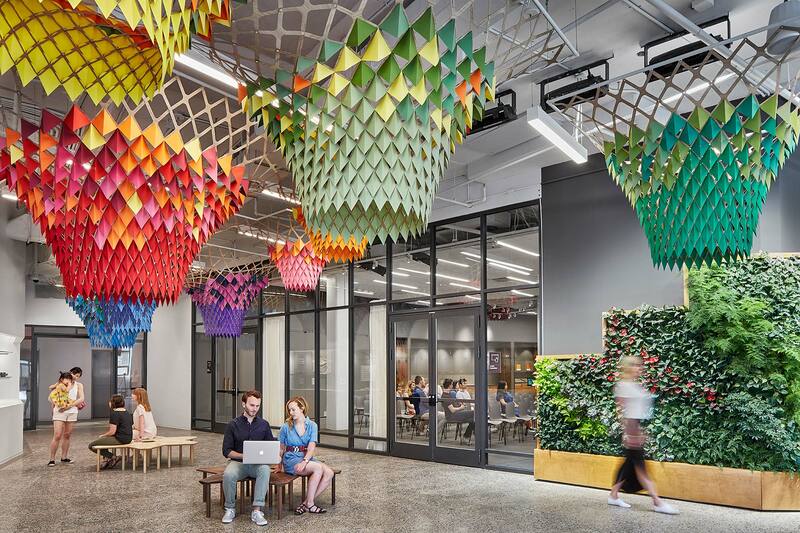 Instagram eschewed the dark finishes and denim of the company’s old offices, moving into space where the neutral surfaces are a canvas for pops of color provided by video screens and photos curated from Instagram users. The brand is reinforced through features such as an interactive gallery of Instagram content that updates in real time and playful photo-op backdrops that visitors and employees can customize with lighting effects. At the heart of the operation is the story conference room, where editors huddle to plan news coverage. 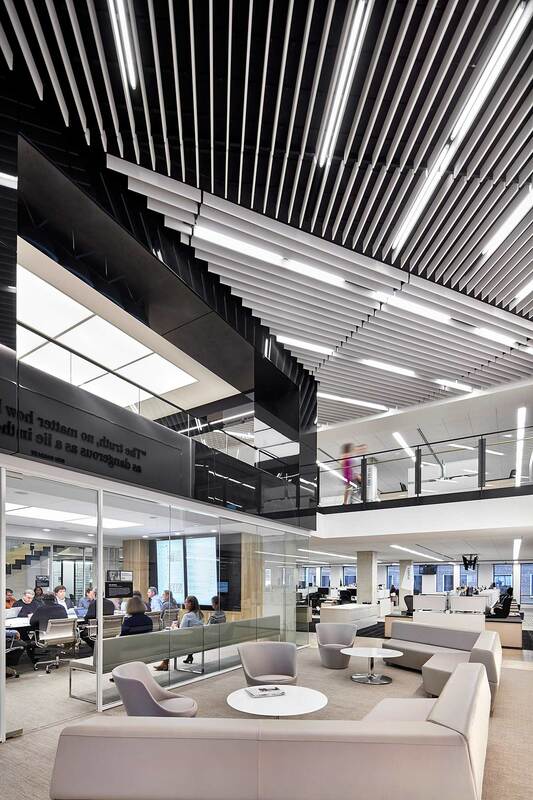 Gensler’s new 248,000-square- foot headquarters for the Washington Post is fueling its transition from a print company to a multimedia company, albeit one that remains mission-driven. Throughout the workspace, famous front pages and quotes from Post luminaries recall the rich legacy of the paper’s award-winning reporting. But the space is shaped to accommodate journalism’s new age, with the technology-rich hub of the newsroom placed among interdisciplinary content creation teams that collaborate on the company’s print, video, broadcast, and social media channels. AUTHENTIC: People find meaning in work settings that embody values. RELEVANT: Experiencing a sense of purpose is central to working life. ENGAGING: Design gives purpose emotional life to make it actionable. FLEXIBLE: Purposeful workplaces help people approach change positively. What are the key elements of a great experience, and how can we measure and track its business impact? Companies are focusing on new ways to measure return on investment as they leverage experience to deliver improved brand loyalty and business performance. Our new research effort, the Gensler Experience Index, seeks to provide quantifiable connections between experience, design, and positive business outcomes. 1. MEASURING EXPERIENCE REQUIRES A COMMON LEXICON. Experience means different things to different people. To truly understand the connection between design and experience from the user perspective, we need to understand the language through which users understand and express experiences. 2. MEASURING EXPERIENCE IS MEASURING PEOPLE. We continue to expand our research toolkit to include psychographic analysis, demographic analysis, and other methods to understand the complexity of the human experience and its connection to design from multiple angles. 3. MEASURING EXPERIENCE WILL BE DIFFERENT FOR EACH INDUSTRY. Because experience encompasses so many elements, we will develop different metrics and rubrics for each industry, and document best practices that vary not only by industry, but also by demographics and geographies. How does design influence our emotions and sense of place? Our new research initiative, the Gensler Experience Index, seeks to uncover the universal drivers of great experiences. These findings will inform innovative design solutions and strategies that drive emotional connections and customer loyalty.